These pillows are personalized with your family's details in a playful homage to a classic library card. 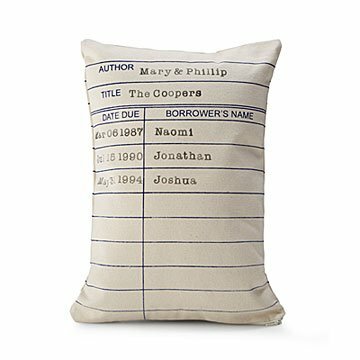 Check out these pillows personalized with your family's details in a playful homage to a classic library card. With your family name as title and parents' names as authors, children become the borrowers with their birthdays as check-out dates. Fun home decor accents for librarians, teachers, and book lovers, they'll quietly add color to any couch or bed. Designed by Rebecca Rodriguez; made in New Jersey. Machine wash, air dry, low iron as needed. So pleased with this unique gift! My four boys and I got this for my husband, their dad, who is an avid reader. I added the boys names and birthdates. When he opened it and said, "Look at all those cute babies," everyone laughed. He told me later that seeing them listed like that with their birthdates immediately brought forth images of each boy as an infant. It sits on our couch and everyone that sees it has a comment. I absolutely recommend this product! This is great for my sister that reads all the time. This is honestly the perfect gift, and I was so happy to stumble upon it. It's sturdy and soft enough to use as an everyday pillow on your couch, but looks nice enough to be purely decor. My mom loves how her children's names are re borrowers on a library card. We (mom and dad) customized this for one of her graduation gifts. I ordered this specifically for a friend with a newborn and love of books. It was printed wrong initially but the company was very quick to get me a replacement! Wonderful customer service! Perfect for my good friend's new baby's nursery! I ordered 2 of these pillows for my mother. She has 9 children so I had to split the family names due to the number of names allowed on each pillow. They came promptly and looked uniquely stylish. They were my mother's favorite gift...and she got gifts from all 9 of us. That says a lot. Very, very pleased with this purchase! was an unusual gift and generally well received.